Chile is a crazy country. Just look at the shape of it! If Britain is roughly triangular and France is a hexagon, Chile is a long thin squiggly thing. It clings to the western edge of the Andes, and sometimes it even tumbles into the sea, so that much of the lower half of the squiggle is only accessible by boat. Chile occupies an area no greater than France and Britain combined, and yet, like a gob of chewing gum stretched by a sticky-fingered infant, it reaches from the Tropic of Capricorn all the way down towards Antarctica. If we exclude the country’s claim over the Antarctic peninsula (a claim based purely on proximity), this still gives it a coastline equivalent to one which might run between Norway and Nigeria! Chile’s territory includes the most southerly point of land outside the White Continent, and from this point it reaches north through so many climatic zones that it manages to contain both the wettest settlement in the world and also the driest place. Meanwhile, the country is so narrow that it can hardly be said to have an interior. One can even go skiing and surfing on the same day, the distance from the mountains to the seaside is so short. The crew of Mollymawk are not surfers and it’s been a while since any of us skied, but our overland travels through Chile did take us up to 4,600m. And then we came all the way down to the beach, in one day. And then we went back up to that same altitude again, the next day. This article describes our adventures for the benefit of others who might be planning a similar trip, and for those who are happy to travel vicariously it’s a chance to glimpse some of the more spectacular parts of this weird, weird world without adding to the carbon overload. 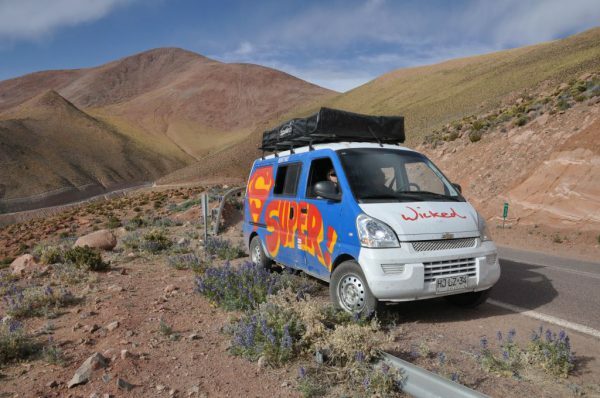 To recap – our own makeshift campervan had broken down, and so we abandoned it in the town of Los Vilos and pressed on aboard a vehicle hired from Wicked Campers. The new van was a lot smaller than I had anticipated, and it was also a lot more colourful than we would have liked… but I will save it till the end of our journey to recite the pros and cons of a Wicked van. All I will say at this stage is that the model which we hired was hellish noisy. We rattled and roared along the motorway in our brightly painted tin can, passing through cactus-covered hills. 200km north of Los Vilos, as the day drew to a close, we reached the latitude of a small seaside resort called Tongoy, and this seemed a suitable place to look for a campsite. 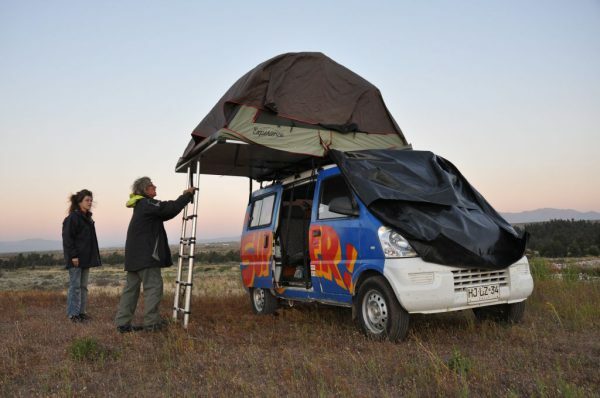 Whereas with our own van we could park up pretty much anywhere, the new affair was equipped with a tent on the roof. The tent opened up like a book – meaning that it occupied a space twice the width of the van itself – and for that reason we were now obliged to rethink our ‘stop-where-you-drop’ philosophy. 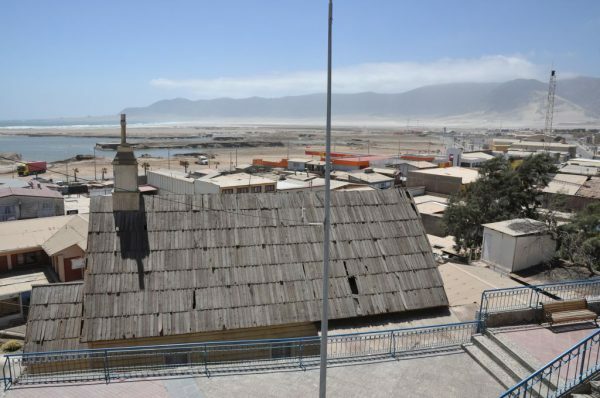 Tongoy proved to be a shabby affair focused on a splendid wave-swept beach. We were to learn that it is fairly typical of its kind. Imagine a run-down version of a very diminutive English resort, but with a suburb of shacks in place of the caravan parks, and you’ll have formed a fairly accurate picture. There were three very dreary-looking campsites perched in a line on the edge of the beach. This being early in the season, only one was open. They wanted 4,500 pesos (about £5) per person, plus 75 cents for a five minute shower. Cold water only. Stuff that. We drove on – along a road which led through the dunes – past a continuous line of notices shouting NO CAMPING. Every time we thought that we might have gone beyond the domain of the county council there was another notice. So, we swung inland, following another dirt track. By now it was nearly dark, and thus we reckoned that, regardless of the rules, we were unlikely to be disturbed here. 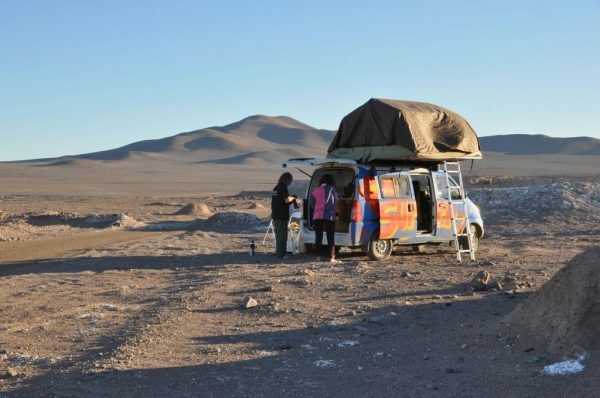 We pulled up the tent – which transformed our gaudy van into a high-rise landmark – and we cooked a hurried supper by the light of our solar lantern. Then we climbed the stairs to bed and made ourselves comfortable; and, indeed, the tent atop the Wicked van was extremely comfortable, being fitted with a thick mattress. This is much, much more than can be said for the seats… But we’ll talk about them another day. At midnight we were rudely awoken by a car roaring past on the dirt track close by. Someone yelled something: Words flung into the night and directed at us. It sounded like the voice of a teenager fired up on booze – so I pulled on my clothes, just in case. Whereas, before, we had simply felt conspicuous, now we felt vulnerable. The only way down from our roost was via the ladder, in single file, rump first. Half a minute later, another car passed and gave one long blare on its horn. The vehicles stopped perhaps a couple of hundred metres away. There was a lot of shouting, from that same teenage voice. And then we heard shooting. It sounded as if a gang of lads had got together to hunt rabbits. We hadn’t seen any rabbits, but we could imagine that the dunes made ideal rabbit terrain. They probably hadn’t chosen this location with the deliberate aim of alarming us, but the effect was the same anyway. Being in the close vicinity of drunks with guns is bound to be alarming. The tent had no windows, so we couldn’t look out. Nor did trying to flee seem like a sensible reaction – particularly since we’d never dropped and folded the tent before and were likely to bungle it if we did it in the dark. So we lay there, worrying that one of the rowdy rabble might loose off a shot in our direction. Eventually, after an hour or so, the cars drove away again. In the morning we were up before daybreak, awoken by the cold (probably about 10 C). The inside of the tent was running with condensation. Outside, we could hear the waves crashing onto the beach. The disruptions of the night, following upon the breakdown of our own van, seemed to me to be inauspicious. I’d always said that we shouldn’t really be driving all this way – I’d always said that it was environmentally reprehensible – and I’d always been unhappy about leaving the dog and the cat, even though they were in the very capable hands of our good friends and fellow cruising yotties, Mikael and Lena. 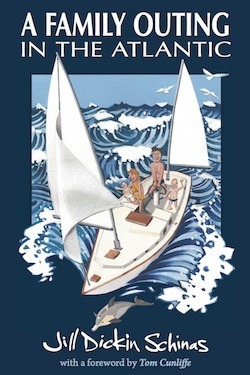 I was feeling so unsettled that I even began to worry about the boat, too – and that’s a thing that I never do! The weight of my concerns sat on me like a premonition – but the rest of the team were immune to the bad vibe, and so we pressed on. There’s basically only one road to speak of in Chile. 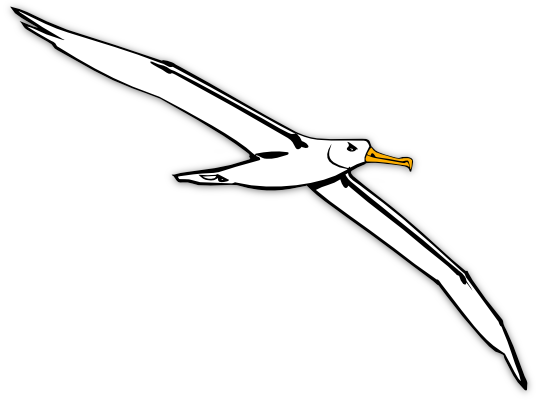 It ascends the coastline (albeit, seldom with the sea in sight) conveying the itinerant through the climatic zones with remarkable speed. 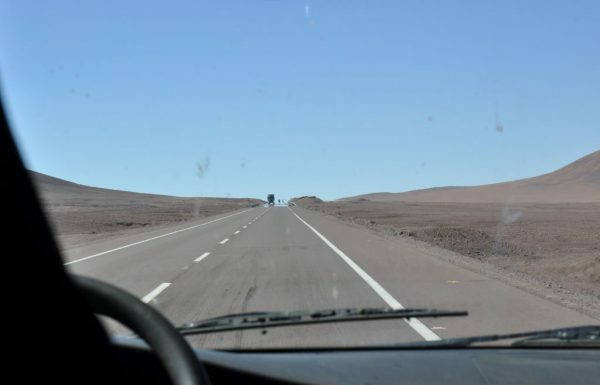 Already we had long since left behind the fertile plain which is the source of the nation’s fruit and veg and wine, and within an hour of leaving Tongoy we had seen the last green tree and were following the long black ribbon into the Atacama Desert. All around us the vista was of nothing but dirty sand and gravel reaching towards barren hills and hazy mountains. We passed through an oasis, where a group of dusty date palms huddled beside a clump of houses and a thicket of acacia. Then the scenery reverted to a moonscape. Indeed, there are ‘conspiracy theorists’ who would have us believe that the Apollo moon-landings and Rover’s recent reports from Mars were actually filmed somewhere in this vicinity. Eventually, the conveyor belt took a turn towards the coast. It delivered us into a little town called Chanaral, and we hopped off to buy fuel. Chanaral clings to a steep hillside in the mouth of a broad dry valley. Below the settlement the surf rolls onto a splendid sandy beach, and one can imagine that it might easily have become a popular holiday resort – might have done, but for the fact that another industry has already ruined the place forever. Far away, towards the head of the broad valley which Chanaral overlooks, there is a mining town called El Salvador; and when it rains in the mountains and the rivers suddenly spring to life, the waste from the copper mines in El Salvador washes down the valley. As a result, Chanaral’s fine sands are toxic. Needless to say, the toxins also wash out into the sea, but being out of sight they are henceforth out of mind, and the devastation which they may wreak on aquatic flora and fauna is unknown. We bought our fuel and then we pressed on – like everyone else – letting the grey road pull us deeper into the desert. This one artery carries the commerce of the nation. All those commodities which don’t go by sea, from one principal port to another, travel on ‘Ruta Cinco’. 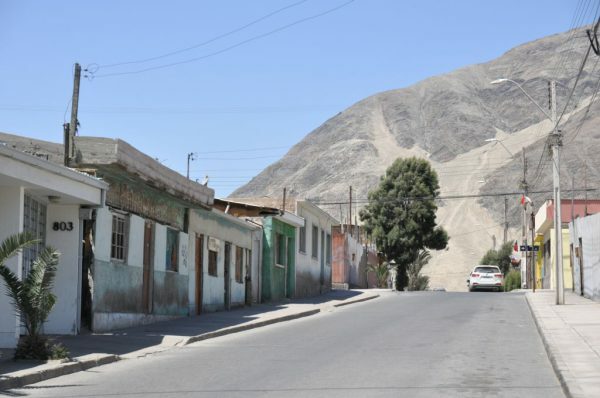 Like ants trundling up and down the trunk of a tree, lorries pass to and fro along the road hauling tomatoes and watermelons from the fertile plain south of Santiago to the desert towns of Iquique and Arica. Bigger, heavier trucks cart copper from the mines hidden away in the mountains; and others drag along tons of salt from the lithium mines in the Atacama pan. We followed the lorries, often riding in their slipstream to save fuel, yet still trailing our own invisible plume of CO2; and the road took us all into the Valley of Death. 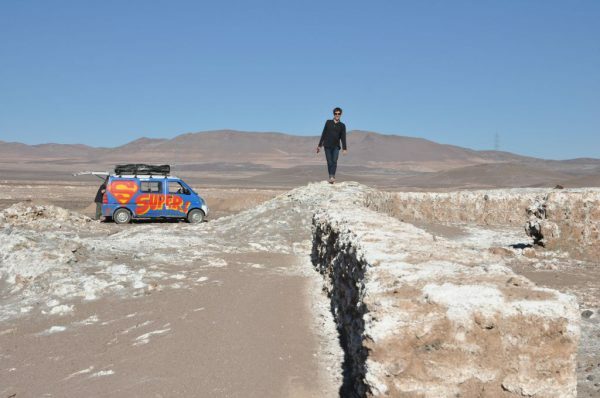 I have never seen a desert like the Atacama. I have never seen anywhere which is so totally and utterly, vastly sterile. I like desert places. I like the Namib, with its huge orange sand-dunes; and I like the Cape Verde islands, which are actually far-flung pieces of the great Sahel desert. I love the desert heat, and I can tolerate the aridity and the dust. 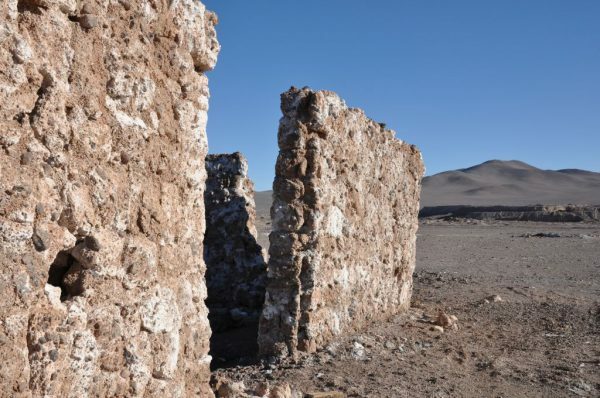 I’m fascinated by the plants and animals which have evolved, over millions of years, to cope with the lack of water; but in the Atacama there were no such plants and animals. No beetles poked their heads out at night to catch the dew – for, as we were to learn, there is no dew. No beetles and other insects means no lizards or snakes; and nor did we see any birds, which might prey on both the arthropods and the little reptiles. There weren’t even any seed-eating birds, because there weren’t any seeds. On the edge of the desert we had seen clumps of a purple-flowered shrub which, upon closer inspection, proved to have the fat stems and leaves of a plant which must hoard its water. 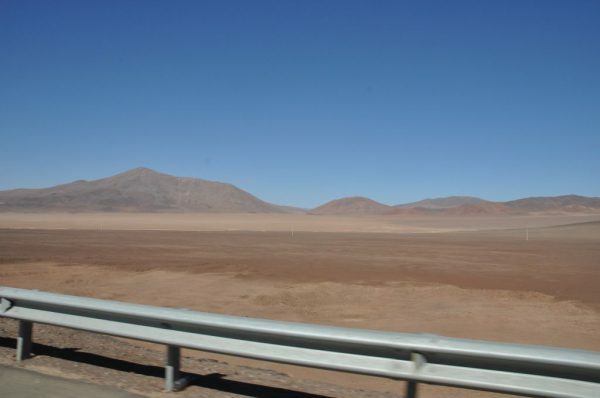 But in the heart of the Atacama desert there were no such plants. There was nothing except sand and gravel. And it went on and on and on and on, reaching for hundreds of miles. We stopped to buy more fuel in a place called Agua Verde. Seven dusty algorroba trees, a row of dusty fuel pumps, a shack where you pay for your fuel and buy ice lollies – and nothing more. No sign of any agua, whether green or otherwise. The men operating the pumps wore scarves around their heads, and they told us that it was dusty and windy here every day, all day and night. We finished our lollies and pressed on across the impossibly barren plain. Yeah, but we were following a busy road. Hardly a minute passed when we were not in sight of another vehicle, following the caravan route across the wasteland. And then we left the road. We left the road to look for a camping place. All across the plain and on the lower slopes of the hillsides our map showed old, abandoned copper mines, and each mine was tethered to the big road by a dirt track. We followed one such track until the lorries on the road were too small to see. I cooked a dusty stir-fry under the tailgate, on the one-ring gas stove, and we ate our supper in the brief twilight, watching the sky fade from orange to yellow, before night pounced upon the scene and all was blackness. We were all alone – as alone as if we had been in the middle of the ocean. And this time the only thing to disturb our night’s sleep was a breeze which shook the tent as if it were a badly set sail, making it flap and slap. Our story continues with next week’s article.